I know this post will invite tons of scrutinizing to everything I write, but I’m a teacher and can’t keep quiet when very basic rules of the English language are completely ignored. 1) Apostrophes are used to show possession. For example, “The woman‘s red pen ran out and she had to use purple which made her feel silly.” If you want to make a noun plural, as in show that there is more than one, you just add an ‘s’ in most cases. 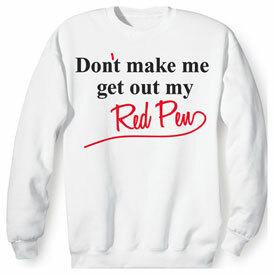 For example, “The teachers discussed the topic of timing in lessons for the whole 40 minute meeting when there were 5 topics on the agenda.” You can also use an apostrophe in a contraction, like the example above (on the sweatshirt), but I rarely see that one misused. I'm guilty of all of those from time to time (more often than I'd like to admit probably). But, even in the light of my hypocrisy, I can't stand to read a blog where the author has continual grammatical mistakes and typos. A few are normal, but continuously having more than 5 in an average post is just too much. I have a huge problem with commas! I like to add them every time I would pause, ya know Teach?